I’m not so fond of ready made food. But sometimes, once in a while, a get very lazy (Ah! I’m always lazy!!!) and use industrial stuff, and that normally happens when I do not read the list of the ingredients BEFORE I buy it… And that doesn’t happen so often… But sometimes, you know, you find yourself in the aisles of one of the biggest Chinese supermarket in town, you see colourful stuff, written with nice ideograms, with a nice picture on the package and you think: Well, why shouldn’t I buy it??? Cut red pepper, onion and potatoes (peeled) in thick stripes. Stir fry the onion with the oil, add the vegetables, stir fry for few minutes and add water. Once the vegetables are cooked, add the curry stuff and the fish. stir and cook for 5-10 minutes or until the fish is cooked. Serve immediately, with some rice. Ciao Sara – Actually Japanese curry is its own subdominion of curry – it’s sweeter than Indian in my opinion, and thicker than Thai curries. But yes, it’s better not to read the package! Although I do a lot of Japanese cooking, I’ve never been a huge fan of Japanese curry, which seems to have made its way from Britain rather than India. 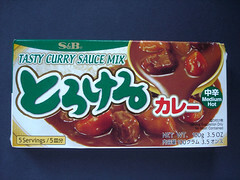 A brown European-style roux with Indian spices, basically, Japanese curry falls essentially in the category of a gravy. In Japan it’s kind of comfort food, and you’ll find it served at home, at cheap “karee-ya-san” or in family restaurants. I have the same exact package sitting in my pantry for the past 5 months…waiting….anticipating…wondering. …”when will I be used? JAPANESE CURRY = ONE OF MY FAVORITE THINGS EVER EVERRR?!?!@?! Yes. Sodium-alicious! I even like bad curry! Maybe. I mean, as long as there’s good rice to go with it. @Jason: exactly: gravy! It had the consistence of gravy! @Steamykitchen: give it a try! Really it wasn’t bad at all! I tend to like the S&B black boxed hot curry mix. It tends to be little thicker than the “and sauce” sister in the green box. I often add sweet potato or apples to it and I think it turns out just as good as the stuff they churn out at places in LA like Hurry Curry or The Curry House. Wow… this is soooooo tasty!!!! HEy, it’s Louise again. 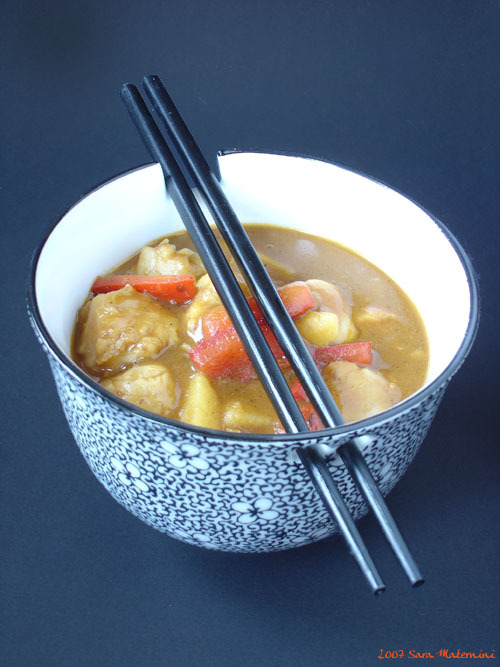 I checked back today and noticed your curry post…which was funny because I made a japanese curry last night too! I think the brarnd I used was different, but you’re right, as long as you add enough fresh veggies it turns out okay. It looks really good, and of course you have to try these thing that call out to you in foodie shops! カレーライスは美味しいですね… I love Japanese curry. So yummy! And although I find your photo beautiful… surely you didn’t eat it with the chopsticks?! They don’t even do that in Japan, it’s too saucy, a spoon is always used!